Hotel degli Orafi is a highly-recommended four-star hotel in the heart of Florence, a few yards from the Uffizi Gallery in one direction and the Ponte Vecchio in the other. I stayed at the hotel for two nights in April 2008, having booked online a few days beforehand. The hotel's entrance is unobtrusive but smart, on the corner of a street which runs along the banks of the Arno, just a few yards from the Ponte Vecchio. Reception staff were friendly and helpful. I had booked a single room for €150 per night; on arrival the receptionist doesn't realise I already have a booking and offers me a slightly lower last-minute rate. Upon explaining, he offers to upgrade me to a double room. All the staff I encounter are charming and speak fluent English; they readily provide assistance such as an adaptor for my UK plugs. The entrance area is small, with a lift and stairs ascending to the upper floors of the hotel. When I explore the building, I find various public spaces around the hotel, including a sitting area adorned with scraps of fresco. The grandest spot is the breakfast hall, described further down this page. On the roof is a lovely bar with an outside terrace and friendly waiters, though drinks are at typically high hotel prices. A voucher for a complimentary drink was presented on arrival at the hotel and it was a good way to commence my stay. My bedroom is well-furnished and very comfortable; the kind of hotel room which makes you sigh with pleased relief when you open the door. It is a reasonable (though not generous) size, and carpeted, with a very high beamed ceiling, and a view over quiet back lanes. The furniture includes a suitcase stand, mirror, desk, mini-bar, bedside tables, TV, a wardrobe containing a safe, a round coffee table and two upright chairs. There aren't any coat hooks, though, nor a convenient socket for mylaptop. I also find the lighting rather low for working. The en-suite bathroom is marbled and fancy, with floral lights over the mirror. It is nicely designed for use by two people, with twin wash basins and a toilet and bidet at the far end in a separate cubicle with a frosted glass door. There are good-quality toiletries laid out. The hotel also provides a dressing gown, slippers and free mineral water. There is a turn-down service and on my first evening I find the gift of a 'Hotel degli Orafi' tshirt laid out on my bed. I find the room very comfortable and quiet during my two-night stay. The one real problem is when I fail to realise than all the electrics in the room are connected and operated by the card-key. When I turn off the light outside the bathroom at night, I am also turning off all the room's electrical appliances - including the mini-bar and more importantly my laptop, which I intended to charge overnight. This causes me big problems the next day when the battery runs out during my journey. The breakfast room is on the first floor and it is the most elegant I've been in. I can't believe that I have dined under frescoes at two hotels in a row (the other was the Albergo Cappello in Ravenna). My first morning I rise early and as the second person in the breakfast room I bag a table by a window which offers a view of a tiny part of the Ponte Vecchio. The room is long with plenty of tables laid out; I don't see it get uncomfortably crowded during my stay. 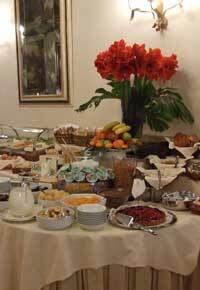 Hot drinks are brought by the efficient waiters and the buffet breakfast is laid out on several groaning tables. Italian breakfasts rarely satisfy foreign visitors, but the Hotel degli Orafi's buffet is one of the two best breakfasts I've encountered in Italy so far. There are all the usual things, helpfully labelled: plain croissants, creme croissants, cereal etc. There is a choice of meats, of cheeses including brie, and of bread (with a toaster). There is a hot tray containing scrambled eggs and bacon (or the Italian equivalent). Among the more unusual offerings are cake, cheesecake and salad. 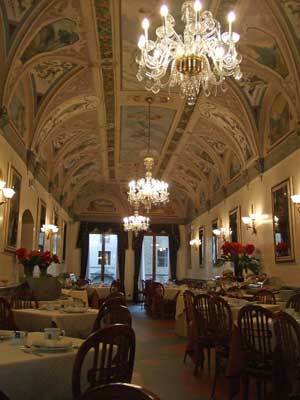 Since breakfast is available till 11am, one could even pay an early visit to the Uffizi and then come back to the hotel for a late breakfast. 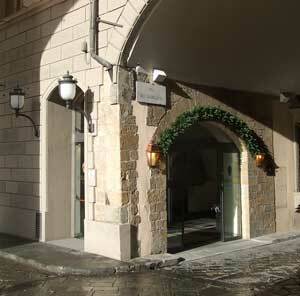 The hotel is at Lungarno Archibusieri 4, around a fifteen minute walk from Santa Maria Novella railway station. With a light case I was comfortable walking; if you have heavy luggage I'd recommend taking a taxi or a little urban bus from outside the station. The hotel is between the Uffizi Gallery and the Ponte Vecchio; literally just a few yards from each. This is an excellent four-star hotel with a light, modern touch. I found it extremely comfortable with polite and helpful staff. The location is perfect for sightseeing and getting around town. It is ideal for travellers who want a special stay in Florence and I think it would make a great hotel for a romantic holiday or honeymoon - especially if you book a room with a view. My room didn't have a special view, and if the hotel has a negative point, it would be that it is rather hemmed in by its location, especially by the Vasari corridor which runs between the hotel building and the river. Although you can stay comfortably in this town on a smaller budget, the Hotel degli Orafi is definitely the best hotel I've stayed at in Florence. The hotel offers various different rates, room types and packages on the booking websites linked below. To go by my experience, you may possibly get offered a slightly lower rate if you turn up in the evening without a booking, and they have empty rooms. 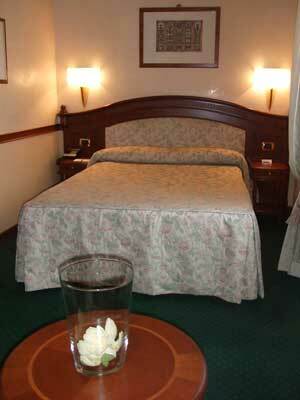 However, the hotel is very popular and Florence is a busy tourist destination, so I would always advise booking ahead. Hotel degli Orafi review by an Italy Heaven editor.